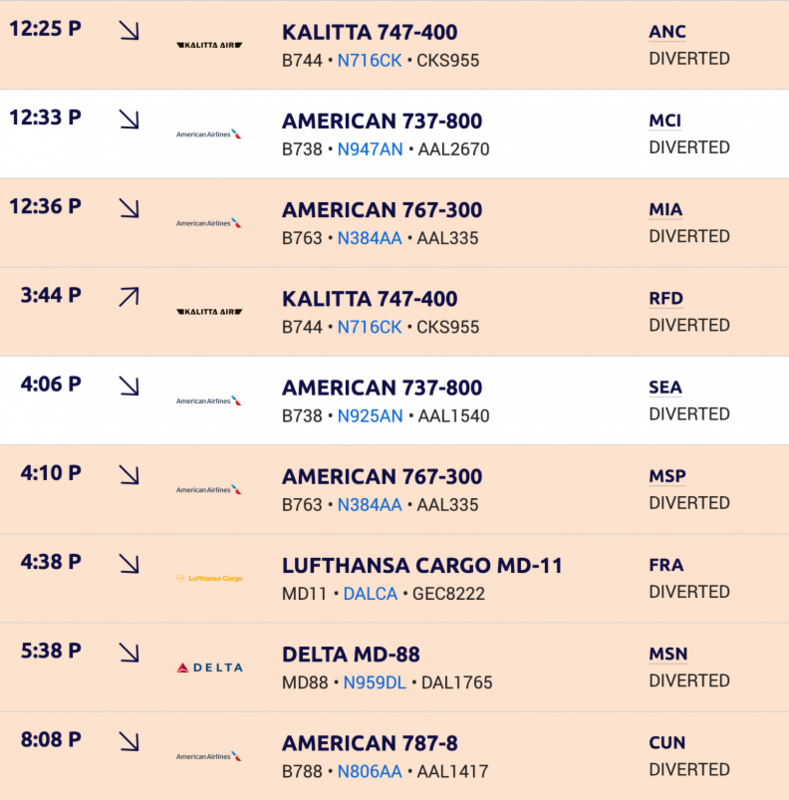 Today was the sort of day JetTip was built for - bad weather in Chicago was causing a trickle of interesting diversions to MSP. The first smart flight alert went out late this morning for a diverting American Airlines 767-300, followed a few minutes later by a Kalitta 747-400. The JetTip arrival/departure board for MSP on January 19, 2019. Flights highlighted in red triggered high priority alerts. As the day progressed, MSP ended up with seven diversions interesting enough to warrant an alert - the Connie 747 and Lufthansa Cargo MD-11 were probably the most interesting from a photography-at-Minneapolis perspective, however, American 335 was also interesting, as it represented a very unusual double diversion... and what's very likely to be the only MSP-MSP flight on an American 767. 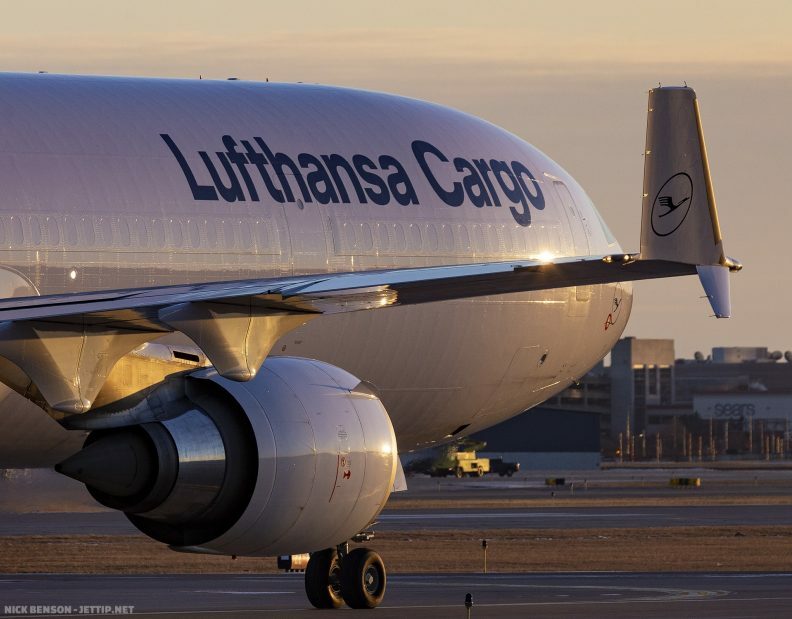 Lufthansa Cargo 8222 (FRA-ORD), which diverted to MSP on January 19, 2019. 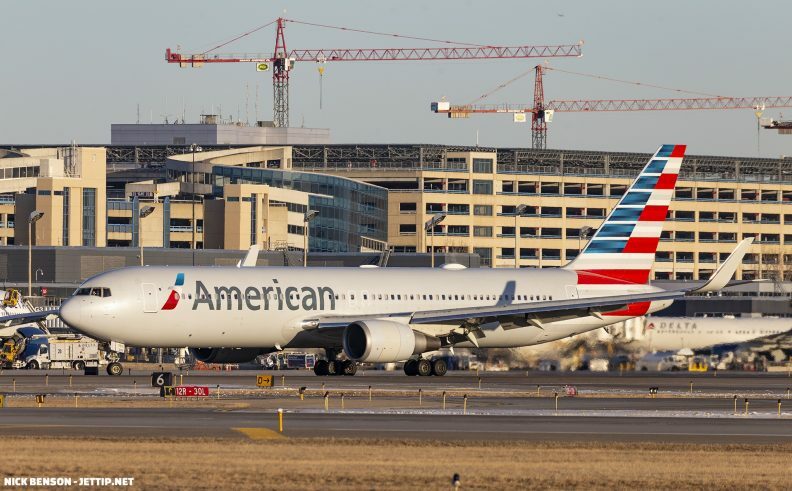 American Airlines 335, flying Miami (MIA) - Chicago (ORD), was being flown by Boeing 767-300 N384AA. It departed Miami at 9:35 AM EST, heading for Chicago. After doing a couple of laps over Valparaiso, it started heading for Minneapolis (MSP), where it arrived at 12:36 PM CST (FlightRadar24 replay). After a quick fuel stop in Minneapolis, AA335 departed for Chicago at 1:35 PM CST. It made it all the way to Rockford, where it did about eight laps in a holding pattern before the very unfortunate decision to divert again was made... and it arrived in Minneapolis, again, at 4:10 PM CST (FlightRadar24 replay). American Airlines 335, heading to a gate at MSP after diverting for the second time that day. January 19, 2019. Kalitta 995 left Anchorage (ANC) at 3:10 AM AKST for Chicago (ORD). It was being operated by a Boeing 747-400, N716CK. It ended up diverting to Minneapolis, where it arrived at 12:25 PM CST (FlightRadar24 replay). Remarkably, Kalitta 995 also ended up being a double diversion. It left Minneapolis for Chicago at 3:44 PM CDT, but eventually diverted to Rockford (RDF), where it landed at 5:21 PM (FlightRadar24 replay). Kalitta 955 departing MSP after diverting here on an ANC-ORD flight. It would end up having to divert again on this flight - landing at RFD instead of ORD. I've been following commercial aviation pretty closely for the last couple of years, the only other instance I can recall of a flight having to divert twice in two consecutive flights was last year, when an Emirates A380 flying to JFK diverted to Pittsburgh, departed for JFK, and diverting again to DFW during the "Snowmagedden" event. As I hit the publish button on this post at 11:00 PM on Saturday evening, N384AA is still in Minneapolis... I hope everyone involved has been inconvenienced by this as little as is possible, and imagine American is doing their best to get everyone taken care of. Nick lives in Burnsville, MN with his wife and three children. He grooves on railroad and aviation photography, geography, weather, and LEGO. A freelance web developer, he started JetTip's smart flight alert service in 2017. He can frequently be found atop a step ladder at MSP's Aircraft Viewing Area.